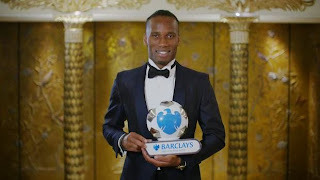 37 year-old Chelsea forward, Didier Drogba has been honoured with the Barclays ‘Spirit of the Game’ award for his numerous charity work in Africa. Drogba who recently raised£400,000 for the Didier Drogba Foundation at a recent charity ball have supported hundreds of children in the areas of education, finance and health. Few weeks ago, The Blues legend launched one of the five hospitals h‎e promised to build for his country as ‎part of his charity activities. “I come from a poor family where I played football in the streets with my friends with no shoes, there was no grass but we still enjoyed it. There is nothing better than when you see a kid with a smile on his face and that is why I’m trying to help. I want to do a lot of things in Africa, I want to give people the chance to dream, and it is easier to dream when you are in good health and happy.” He said in a video released by Barclays. NextArsenal and Manchester United win joint award. Actor, Jide Kosoko reportedly loses wife, Henrietta.